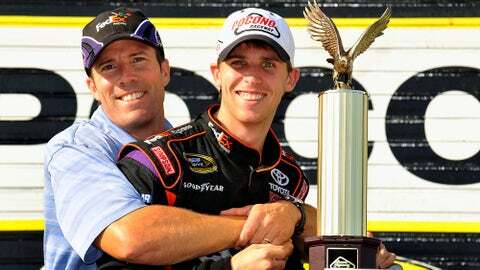 Defending Daytona 500 winner Denny Hamlin is paying tribute to J.D. Gibbs, son of team owner Joe Gibbs, in a very cool way. To honor J.D., Hamlin is putting his name above the driver’s side door of his No. 11 Joe Gibbs Racing Toyota. Check out the video. Since March 2015 J.D. has been undergoing treatment for symptoms impacting areas of brain function that the team said began with speech and processing issues. When the team made the announcement in 2015, officials said doctors believed the issues were related to previous head injuries J.D. suffered. He played quarterback and defensive back in college.